Preface: This article was first published about ten months ago and I had hoped to see some positive changes by now … Sealed borders, illegals held accountable or sent home, a Commander In Chief taking responsibility for his Constitutionally Mandated task of protecting the sovereignty of American soil … But all I see is a situation that has worsened by magnitudes. So this commentary is still very germane and hopefully it will have more impact this time around. I will start this commentary with the intention of reviving memories of an America that the world once admired as the land of promise, opportunity, freedom and liberty. People from across this ever shrinking globe once dreamed of immigrating to this great nation to build a new life and raise a family free of poverty and oppression and make their fortune. Most sold every last thing they had to purchase a ticket on some tramp clipper or steamer and risked a voyage of unseen or unimaginable danger just to see that dream realized. When they arrived here poor, tired and weakened from a long harsh journey, their last thoughts were “If I stick my hand out what will America give me?” but instead they pitched in to help build America. They worked long, hard backbreaking hours at menial jobs to slowly advance their position and status in their newly adopted country. They were adventurous, industrious and resourceful. They fought in wars to protect their new found liberty, they educated themselves to our language, customs and culture, and worked hard to acquire citizenship in a land they came to love, not only for themselves, to solidify their position in this society, but most of all to facilitate a better life for their children. 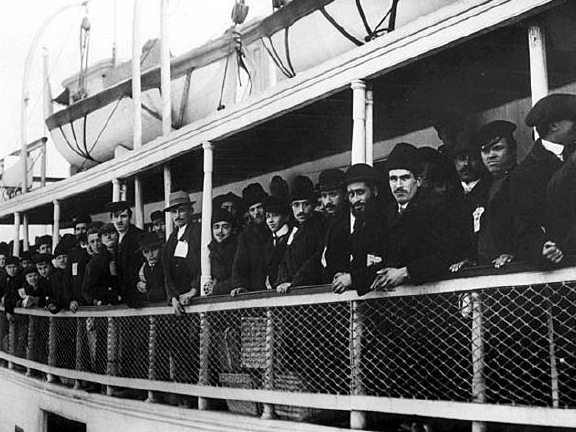 These immigrants were proud to be Americans to a point of extreme, never taking for granted what they considered their good fortune (no matter how trivial by most standards), nor did they ever forget the reasons that had motivated them to leave their distant homes in the first place. Now fast forward to the present and the steady stream if illegal immigrants flooding into this already overburdened country and run a quick comparison. I will not try to convince you that all are bad at heart, because that is not true. And some of their expectations and misunderstandings are by intention and the fault of a government with an agenda … this government! But what we in reality face is a vast majority who can’t speak English and are not so very willing or motivated to learn, keeping them isolated from mainstream society, employment or serious education, and choosing to congregate with their own culture rather than assimilate into the native culture. Instead of these immigrants striving to become a integral part of the society that is hosting and indeed supporting them in so many ways (welfare. Healthcare, housing, education), this government institutes policies that force the American society to accommodate them and their shortcomings, such as the aforementioned language barrier. These actions ultimately result in the retardation of the need or ambition for learning or working and facilitates the perpetuation of this burden on you and I … and you have to know this government is very aware of this. A large majority are being supported by a government (through our tax dollars) intentionally bent on perpetuating this burden on the already overburdened taxpayers to suit an agenda that is not in America’s interest. But there is also a large number who are outright hostile towards this nation, seeking only what they can get with no investment of labor or ambition and denigrating their benefactors at every possible chance. These individuals are destructive to society, perpetrating and perpetuating crime and larceny on their newly adopted communities in the form of criminal gangs. They also see America as the land of opportunity, but not in the way of past immigrants. They don’t like us Americans for who we are, and are not shy to say so … but they seem to be very OK with America for what they can get … or take! Before you accuse … This is NOT about bigotry or prejudice in the least. My wife is Hispanic making my children and grandchildren of Hispanic descent. Neither the language you speak nor the color of your skin make any difference in this scenario! This is about the fundamental change we were promised … and are getting in spades. This being forced on us by a government complicit to globalists intent on changing the landscape of America forever … whether We The People like it or not. Can you say North American Union … ??? … !!! America is a compassionate society and we have always welcomed immigrants from across this planet with open arms, but as equals in the application of the laws of this land and in the services and benefits rightfully earned. In plain words, what applies to us should damn well apply to you, both legally and socially! But when illegals receive preferential treatment with respect to the law and services without ever having contributed to said benefits or services, over those who have worked hard and contributed to the payment of said services and faithfully obeyed the law, a fundamental trust has been broken and anger and resentment rightfully swells in the heartland of America. I look at these two scenarios, past and present, and I wonder where it all went wrong. When America stopped being the land of promise and opportunity, the shining castle on the hill, a place where hard work and social participation lead to a life of reward and increasing prosperity … Camelot, and became the welfare capitol of the world.